My dahlias are late this year, though it could be because I dug the whole lot up and replanted them – late. There are some blooming, but they are bedding dahlias. I’m more interested in the tall-stemmed cut flower types. 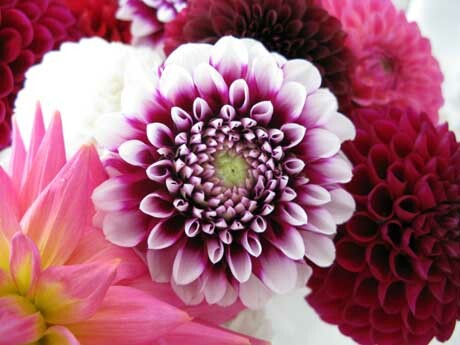 I’m pining for a good dahlia bouquet to bring indoors. 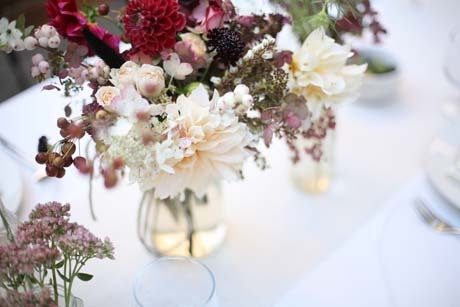 I guess, while I’m waiting, I will have to appease myself with these two gorgeous but completely different bouquets, one flouncy and feminine (from Ruffled Blog), the other more rustic (from Inspired By This), with fruit (blackberries), seed heads and herbs. Hurry up, dahlias. I want to make up some beautiful bouquets of my own. 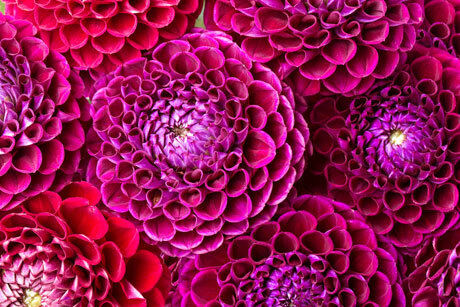 Dahlias, with their vibrant blooms and tall stems, are ideal for picking. And if you don’t like red ones, there’s a white or pink one, yellow or orange one, or salmon, cream or greenish one that will suit you. 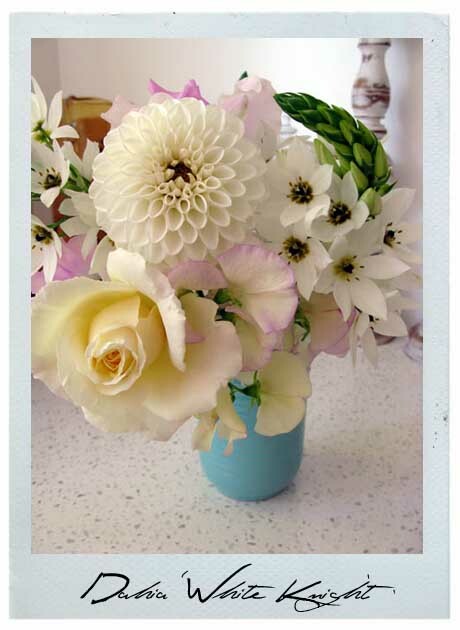 Their flowers come in all colours and different forms, including Cactus (with double blooms and narrow petals that are rolled or straight, incurved or recurved, giving them a spiky appearance – like the middle photo above), Decorative (double blooms showing no central disc), Pompom and Ball (an obvious pompom shape with no central disc, like the bottom photo), Anemone (with small petals in the centre with larger petals surrounding those), Waterlily, Peony, and a few others. 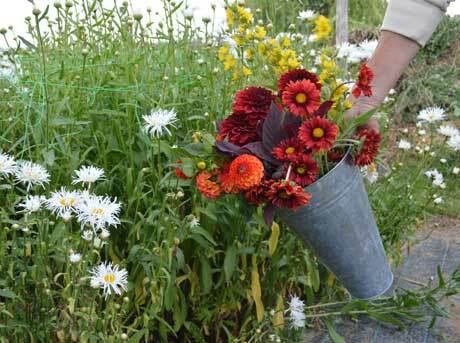 There are literally thousands of hybrids to choose, and all are easy to grow. 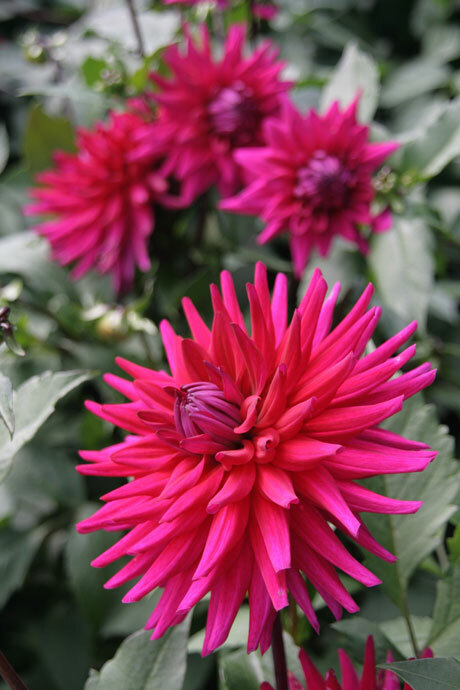 Plant your dahlias in a sunny spot in free-draining soil. 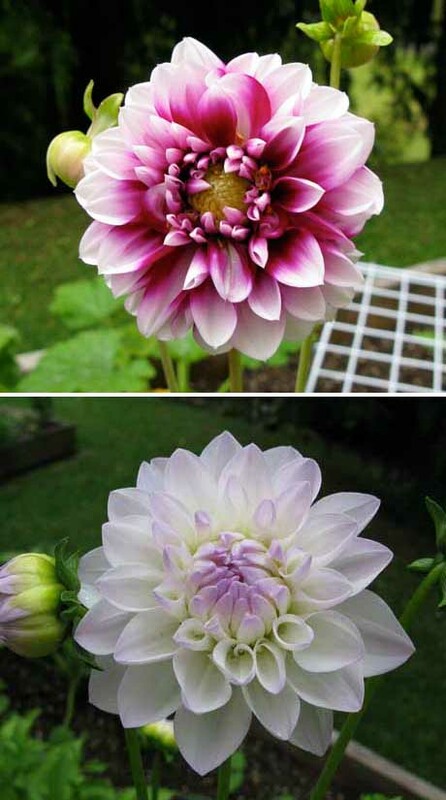 Dahlias don’t dig too deep, so plant them in a spot that’s sheltered from wind. Staking is generally advised, but if you grow a lot, like I do, stakes just look hideous. Best to plant them in a wind-free garden if you grow several. Dig in plenty of compost before planting and add a balanced fertiliser. Avoid using fresh manure or compost that hasn’t quite broken down as these can cause excessive soft growth which is susceptible to mildews and stem rot. 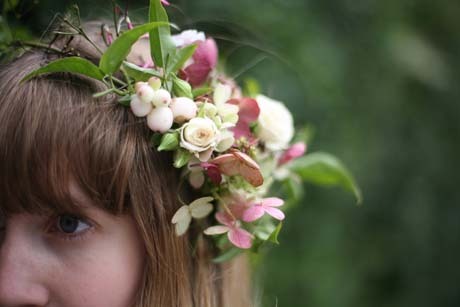 I have a real thing for flowers in the hair. They just look so darn gorgeous. 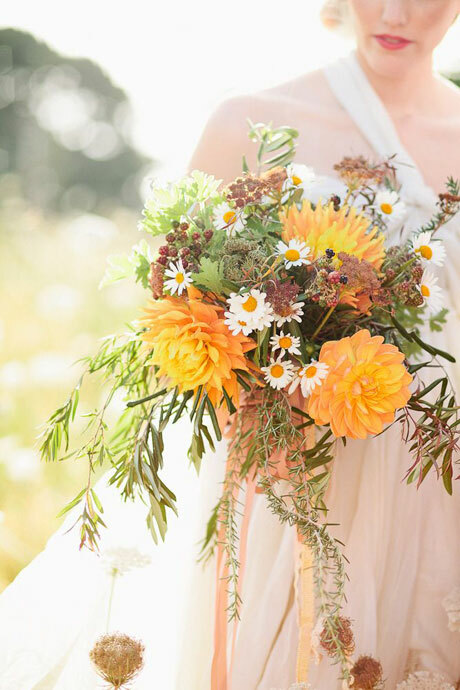 Check out these stunning designs by florist Amy Merrick over at An Apple A Day. 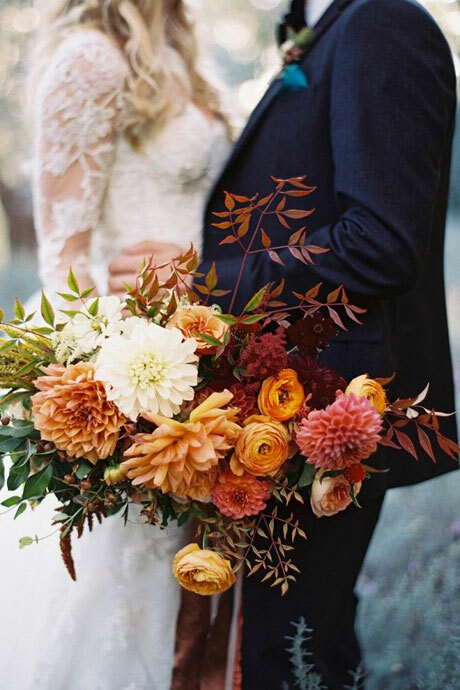 They’re part of the bridal flowers she did for a wedding in Brooklyn. Note the dahlias too. That’s the other thing that gets me excited. And these ones remind me that dahlia season is just around the corner. I can’t wait! 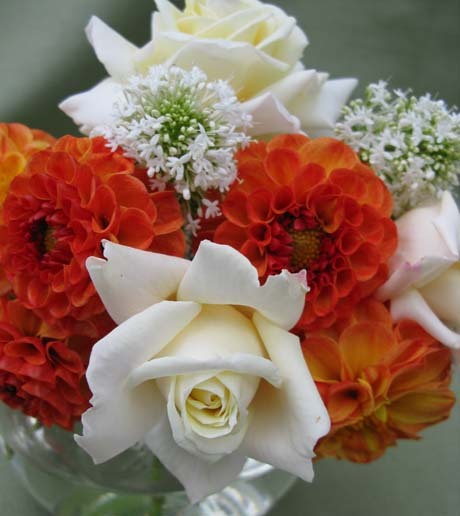 A pretty bouquet for the dinner table – small orange pompom dahlias (‘New Baby’) and creamy white ‘St Paul’s Cathedral’ roses. I do love being able to trot outdoors and pick a posy whenever I please. 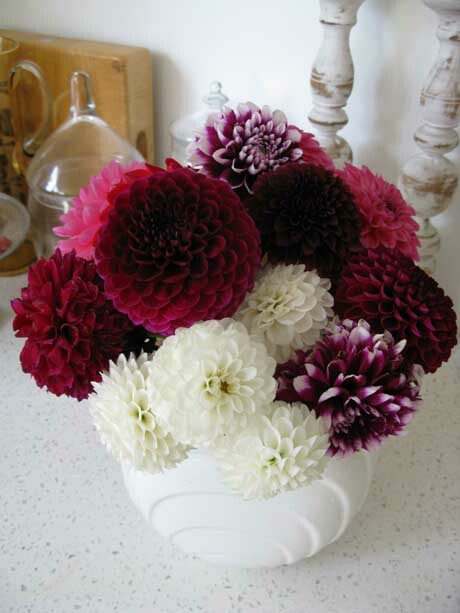 I have five more dahlias flowering now, all with super long stems ideal for picking. Here’s two of them, but don’t ask me their names. I got these two in a lucky dip from Dahlia Haven (although I’m sure I could find out their names if you’re desperate to know). 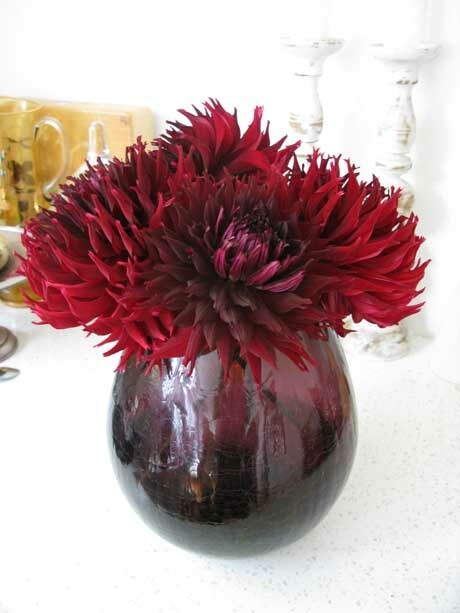 If you haven’t been to Dahlia Haven before, or ordered up large from their website, you absolutely must! 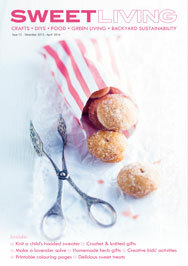 Their 2011 catalogue is online and it’s to-die-for. I picked my first dahlia yesterday, 11 weeks after I planted a heap of tubers of varying varieties. It’s quite the show-off, I think you’ll agree, with its pure white blooms forming a perfect pompom. 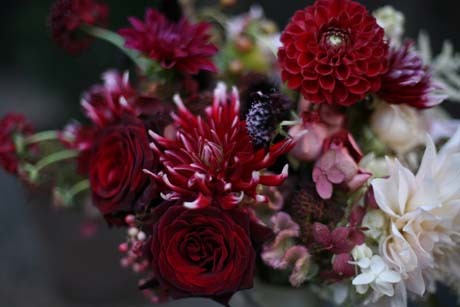 The heads aren’t too big (8cm in diameter) but they’re quite exquisite, and they’re meant to be excellent cut flowers. This variety is called ‘White Knight’. Here it is with sweet peas, the rose ‘St Paul’s Cathedral’, and chincherinchee (Ornithogalum thyrsoides), which has white, starry flowers. I can’t wait till my dahlias bloom, but that’s still a wee way off yet. In the meantime, I’ve been getting my kicks by eyeballing this exquisite bouquet by Nicolette Camille Floral Design for Once Wed. 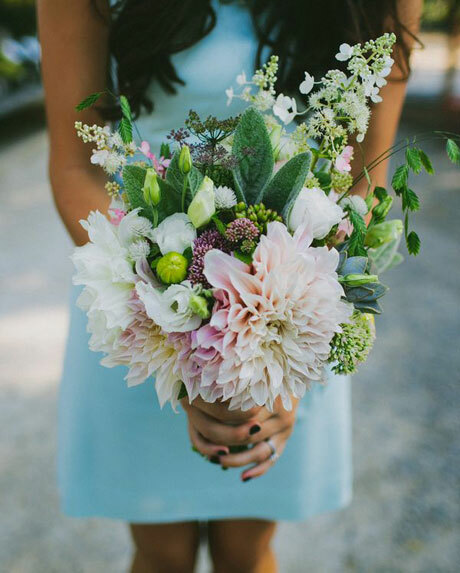 Delicious dahlias, roses, white scabiosa and starball scabiosa are interspersed with hydrangea florets, and all are pulled together with a simple but elegant white ribbon. Divine!